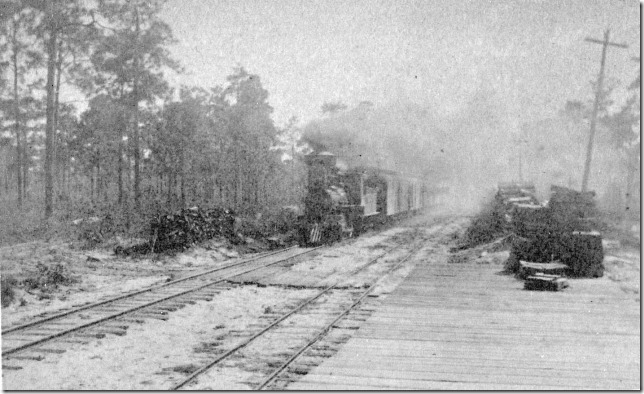 Above is a picture of a Florida Southern mail train headed north from the Fruitland Park depot taken, I suspect, in the mid-1880s. During that time Fruitland Park was known as Gardenia by the United States Postal Service so all mail was addressed to Gardenia, Florida. Until a recent visit to the Lady Lake Historical Museum I’d never seen this picture. Curator, Dr. Norma Delaney, was kind to share it with me. I am still hopeful of tracing those pics auctioned back in 1994. Just shows that one should never give up.